You bet farm shops are special. Consider for example, the new farm shop of LeRoy and Dave Leinenweber of rural St. James. Here are a few of the goodies in their new facility. • It's big - 80 feet wide by 120 feet long and standing 38 feet at the peak. • It's cooled and heated by a geothermal system. • It has a 20 foot by 50 foot hydraulic door in the east end with a 14 foot by 16 foot second hydraulic door built into the big one. At the west end there's another hydraulic door, this one 20 feet by 32 feet. As many farmers have discovered "drive-through" shops are mighty convenient. • It features a lighting system of fluorescent units with stainless steel reflectors providing illumination the equivalent of a basketball arena. Plus six thermo-pane windows in the eastside hydraulic doors and eight windows in the south wall provide additional natural lighting. • Apparently it may become convenient for farm meetings. The local Pioneer dealer was doing presentations to about 20 area farmers on this particular visit. • Energy costs for both heating and cooling are projected at $800 per year versus about $4,000 if liquid propane was the fuel, and about $5,000 if electricity at 5 cents/kw was the energy source. • It's insulated for shirt-sleeve comfort regardless of outdoor conditions. The shop walls are R33; the ceiling is R44. • It cost a few bucks, including about $35,000 for the geothermal system with 9,600 feet of polyethylene lines buried 7 feet to 8 feet deep in the earth just west of the shop, and 7,000 feet of 5/8-inch oxygen-bearing per tubing stapled to the Styrofoam insulation beneath the 7-inch concrete floor (6 inches thick around the perimeter area). The floor also slopes to the center drain-out area. Dave said the geothermal decision "was a difficult choice because of the additional initial investment. But the pencil pushing shows a payback in five to seven years. To make the geothermal system even more cost-efficient, wall construction utilized EPS solid core structural insulated panels. 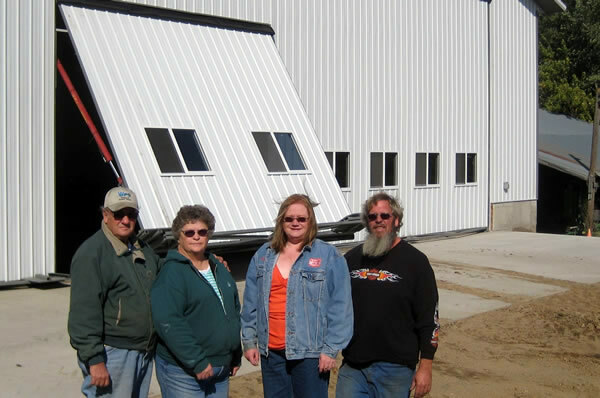 Manufactured by Energy Panels Structures Inc. of Graettinger, Iowa, the panels are made by sandwiching a core of rigid foam insulation between two skins of wood structural gauge metal, 3-foot by 18-foot sheets for the walls and 44-foot 10-inch by 3-foot roofing material. "This system is 15 times more airtight and two times more energy efficient than stick buildings, plus it's much quicker construction. Metal roofing, for example, was precut to the exact length," he said. To get that R33 rating, these 18-foot panels have a 7 1/2-inch thick rigid foam center with 3/4-inch plywood siding. This wall system sits on a 30-inch concrete sill. The concrete foundation, dug 48 inches into the earth, was faced with Styrofoam insulation on the inside. The geothermal system has three separate distribution points to more efficiently provide three zones for the heating and cooling systems. Also two air-handler systems mounted 18-feet high on the south wall use the chilled water from the geothermal unit to air condition the building during the summer. The concrete floor got surfaced with a hardener/densifier product that causes a chemical reaction ostensibly to provide longer life. "It interacts with limestone in the concrete and hardens the top surface immensely," Leinenweber said. Two Nussbaum jumbolift scissor hoists will be positioned into the floor. Why hydraulic doors? "I've seen hydraulic doors in other shops and farm buildings. I like the awning affect. You open up this 20-foot door and you have a 20-foot awning over the concrete approach ramp." And why the smaller door within the bigger door? "That's a matter of energy savings. We just need the big door for the combine and bigger equipment. The smaller door opens quicker and will save heat in colder winter conditions," Dave said. A 5-hp electric motor powers the big hydraulic door with 2-hp motors handling the other two doors. Additional bracing was welded into the frame of the bigger door to support the extra weight of the second door built within the framework of the 20-foot by 50-foot unit. Special latch pins provide stability to both doors when closed. Foam insulation provides R20 values for all three doors. 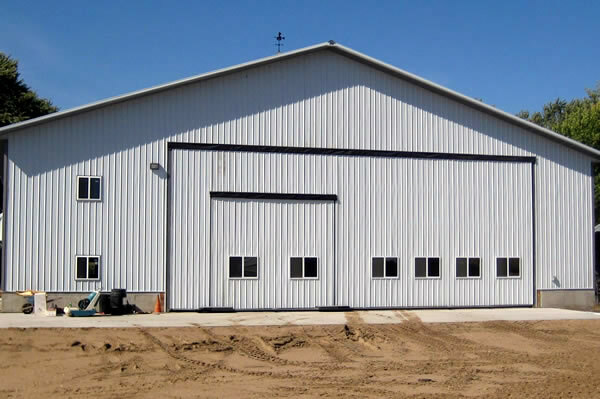 Going with Schweiss hydraulic doors was basically because this Minnesota manufacturer could deliver exactly what the builder needed to meet the engineering safety specs of this door-within-a-door configuration. "They've got a proven reputation. Any questions were quickly answered either by phone or direct visits to our farm," Dave said. Now that this new complex is operational, any hindsight "should have been done's?" "It's great. The only screw up is that I didn't put a receiver in the floor for a heavy-duty vise. Now I'll have to bolt a plate into the floor," Leinenweber said. The contractor for the geothermal system was St. James Electric, Mike Kulseth, owner. General contractor for the building was Tedd Grunzke, SHed and Shinola LLC of Cleveland. Geothermal is really coming on strong in new farm shop construction, and sometimes even redoing old barns into new shops, said Dale Halgen of Terra-Therm Inc., a New Richland firm that has done more than 20 new geothermal systems the past two years. "Energy conservation of any type is what's driving this. And what farmers find out they can heata and cool their farm shops for a fraction of the cost of any other type of energy mechanism, they see geothermal as a wise choice," he said. Comparing geothermal to straight resistance heat such as an electric boiler, he said geothermal would be only one-fourth to one-fifth the cost. Not even considering the potential U.S. Department of Agriculture energy grant money and tax credits now available, payback on geothermal figures six to seven years. USDA grant funds can pay as much as 25 percent of the cost of such projects. Tax credits amount to 10 percent of the entire project, including the radiant floor heat system. The best advice if interested in new energy saving construction is to check with your local Farm Service Agency office. Geothermal is thought of as a new technology, but Halgren recalled that Dean Buendorf, one of the early founders of Terra-Therm on June 8 of this year celebrated his 30th year of selling geothermal heat pumps. He suggested that so-called energy crisis situations seem to simply emerge every so many years. Today's reality is that energy is now an ongoing concern, maybe even a crisis for many. "A lot of the money that we spend on fossil fuels we buy from people who don't really even like us," he said. "So other alternatives have to be part of our future." Halgren compliments farmers about their attitude when talking geothermal. "Their first concern isn't what will it cost me. Farmers take the long term view. They're probably second- or even third- generation, farmers on their land so they're thinking about the future, even for their own kids. They're businessmen and they think their way through these decisions." What's ahead for ground-source heat pumps? You can't improve much on their efficiency which was about 300 percent 30 years ago in a typical residence. He said it is about 350 percent efficient today. "The advantage in shops is that instead of concentrating the water temperature up to 115 degrees to heat a house, you only raise water temperature to about 80 degrees to heat a farm shop floor," Halgren said.